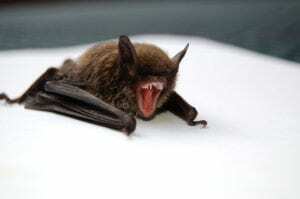 Are Bats Dangerous to Humans? are certainly thought to be dangerous to humans, perhaps due to their nocturnal nature, scary appearance and relation to Halloween festivities. It is true that bats pose a certain safety risk for humans, even if they are not the blood-sucking vampire bats of lore. Human interactions with bats are not very common, as the two species have vastly different waking hours, as bats as nocturnal and typically only venture out for food at night. And when it comes to finding that food, bats are certainly not on lookout for humans. Instead, their diet consists almost entirely of small insects, with certain species of bats also eating fruit, nectar and pollen. And for the most part, bats stay out of the way of humans. They live in caves, crevices in rocks, old buildings, bridges, mines, and trees, or anywhere that other species are not commonly found. Where bats run into issues, though, is during the cold winter months, when they may seek a warmer environment to live in, which often leads the creatures into heated homes. Bats do hibernate during the winter, but are not asleep for the entire duration of the season, leaving them exposed and cold in the frigid temperatures. Bats can squeeze into a home through a wide variety of methods, with the common factor being a small hole or opening that they can wriggle into. A loose or missing shingle on the roof of a house, a gap in brickwork and a simple opening into an attic are all ways bats can find their way into a home. And once inside, bats now have the potential for an unpleasant and unexpected encounter with their human neighbors. Bats are not very dangerous, as they almost never attack a much larger and intimidating human, but they do have sharp fangs which they can bite with if needed. And while less than one percent of bats contain rabies, there is still the potential for the transfer of the devastating disease through any contact with an infected bat. Bats cause further damage and havoc through the spread of their droppings, named guano. The guano itself is not especially damaging, but it contaminates soil, and if allowed to fester can cause certain types of lung infections. Most people exposed to the effects of the droppings will not develop the disease or infection, but the risk remains present around bats. If you notice bats near or on your property, call the experts at Shumaker Animal Control to deal with the problem for you. Our experienced team will take care of the problem in a timely manner, ensuring that your home and property will not be damaged any further by the bats. Call us at 443-854-8072 or view our website at for more information. This entry was posted on Monday, January 7th, 2019	at 6:59 pm	. You can follow any responses to this entry through the RSS 2.0	feed. Both comments and pings are currently closed.